Have you ever taken a dislike to someone for ‘no reason at all’? Or ever wondered why one particular plain, dull person is swamped by a vast circle of friends and a busy social calendar? According to some psychologists the answer is simple – it’s all down to body language. Sheena Meredith explains some of the secrets of our ‘silent’ speech. Body language, it seems, could be the key to all sorts of unsolved mysteries. Experts believe that our ‘silent speech’ – the way we move, small changes in appearance, posture and gestures – conveys far more meaning than the words in any conversation. Body language can make or break any encounter, especially if you’re feeling uncomfortable. Learning the LanguageIf body language doesn’t match words, it makes us feel uncomfortable even if we can’t identify why. Dr. Desmond Morris, the world-famous animal and people watcher, calls these incongruities ‘non-verbal leakage’, the failure of our social ‘mask’, and being able to spot them can help us to make much more sense of our interactions. Watching other people’s body language can also help your own self-image. So body language tactics are not to hide these signs of tension, but to gain mastery and confidence over the environment, to spot when others are being threatening or belittling, and take counter-measures. 'If you don't feel good about yourself, it's going to show. You can only fake it to an extent,' says psyсhologist Dr David Lewis, who teaches people how to use body language tactics to think themselves into a more confident manner. Walk Talk Anyone who’s ever tried to change the way they move, say from being round-shouldered, knows that it takes a great deal of concentration - for a while. It can soon become as much of a habit as a slouched posture. And walking tall increases and creates confidence. Another useful ploy to boost confidence before a tricky encounter is to look up at the sky or ceiling (if you're alone, stretch your arms up as well), then put your chin horizontal and lower your gaze, but keep your eyes and eyebrows in the same position. This simple change of facial posture can make you look, and feel many times more confident. ‘Echoes’ of Friendship Consider how you feel with true friends. There is a sense of relaxation, of freedom from the tension, power plays and uncertainty experienced during encounters with strangers. The key here is that you are of equal status. Among friends, there is a similarity of posture and a mimicry of movement, known as postural echo. It carries the message 'I am like you', making friends 'feel right' together. Popular people seem to have a natural ability with postural echo, and it is often used by successful salespeople. The synchrony is missing in people with serious mental disturbances, and many normal people have poor postural echo. Perhaps because their parents were undemonstrative or unloving, they seem never to have absorbed the unconscious signals of co-operative movement. As the echo goes, so does the sense of rapport, and they themselves may find it difficult to make friends. Minding your Language People signal feeling and intent in 70 body language. Jabbing a raised finger in conversation means power or anger. Turning the head, or crossing legs away from someone you're talking to - however animatedly - shows you don't want to be so involved. 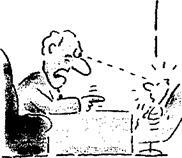 Other 'barrier signals', like folded arms, may reveal a person’s hostility or insecurity. Submission во gestures like nodding and bowing are ritualised socially. We all start to edge away slightly, or sit forward in our chair, when we're too polite to say 'I’d like to leave', and most people will take the hint. Those who don't are likely to be labelled as monopolising bores. Lies and Body Language A whole new world opens up if you're aware of contradictory signals. If a friend, who seems to be listening rarely is tapping her toes as well, changes the subject - she's bored. No matter how charming the boss is being, those aggressive little foot kicks probably mean you'll not be given a pay rise. After a lovely evening, the man of your dreams says he'll call soon, but he isn't looking at you and his arms are folded - don't bother to wait by the phone. Safe Space The way we dominate space is an extension of body language. The more expansive we are, the more powerful, from the hands-behind-head, feet-on-desk pose, to the positioning of towels on a beach or books on a table. Furniture is often used to dominate, like the common ploy of forcing a visitor into a lowly position in the guise of having the most comfortable, squishy armchair. Encroachments into strangers' territory, like placing your bag firmly on their desk or putting your coffee cup down near to theirs, make them nervous and increase your dominance in an encounter. good intent, but it can also be threatening. Intense staring occurs at the heights of both intimacy and aggression. On the other hand, too short a gaze implies disinterest. 3.Can you say what the following words and phrases from the article mean, in your own words?